I am not sure if have tried out Stampin Ups! 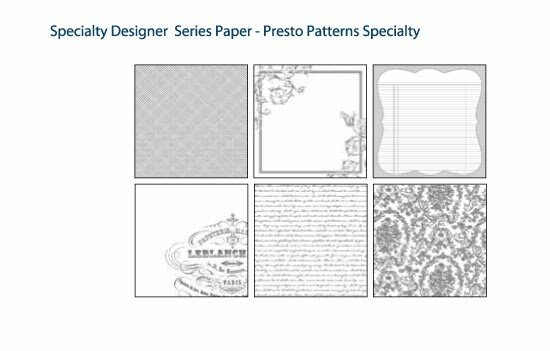 new Specialty Designer Series Paper called Presto Patterns Specialty (item # 117175 from the Summer Mini Catalog) if not you should. This paper is so much fun and the things that you can do are endless. 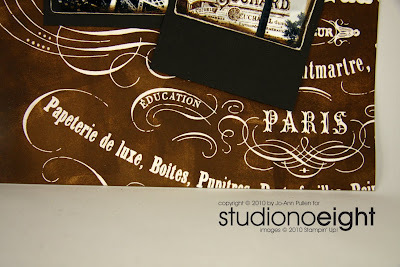 This paper actually appears white with clear glossy designs, they are all vintage which magically reveal the patterns when you use Smooch Spritz, an Aqua Painter, or brayer and ink. 12 sheets of cover-weight paper: 2 each of 6 single-sided designs. Acid and linen free. 12" x 12". Below is my first attempt using a brayer and ink in addition to Versa Marker, dabber, Silver embossing. 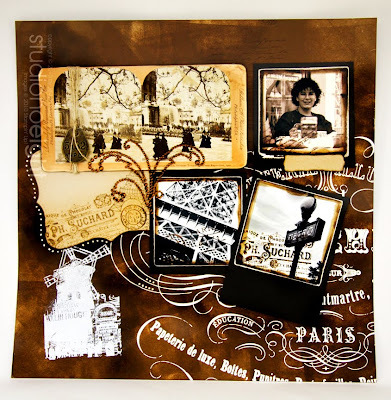 By using the brayer I was able to add many layers of colour which made it look like brown suede. 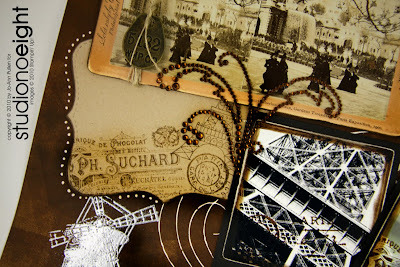 I printed my photo's in sepia tone to give that aged look I even added a antique card showing The Paris Fair c.1900 that I had bought at an auction that you would view with stereopticon which was the first view finder. The picture on the far right is me in Paris having a beverage, hard to believe I was that young and my glasses that big, but it is me. I love how the white design pops out from the brown suede giving the illusion that I stamped it. You can also either wipe off the extra ink on the white or leave it so you get a more texture look. Embossing on it was super easy also as was using the Versa Marker with stamps. 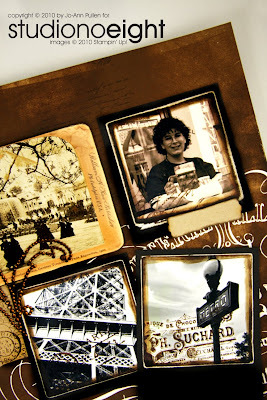 Why I even stamped on my photos to make them old looking and to add more character to them. A little bit of chocolate bling and we are done. All that is left to do is some journaling. Let me know how you have used this product and if you don't have it why not order some and get stamping. 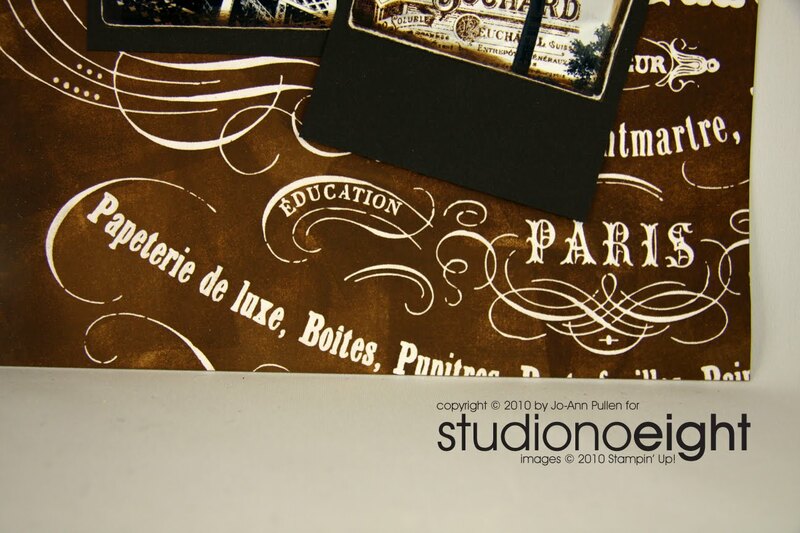 I'm so envious of your trip to Paris! Oh wow, absolutely stunning! I love the vintage look and you hit it bang on. Today's The Last Day for Blog Candy!